Two oversized scorepads (total 80 sheets). Do you need more scorepads? Click on the orange BOOKLET icon to download a FREE version. 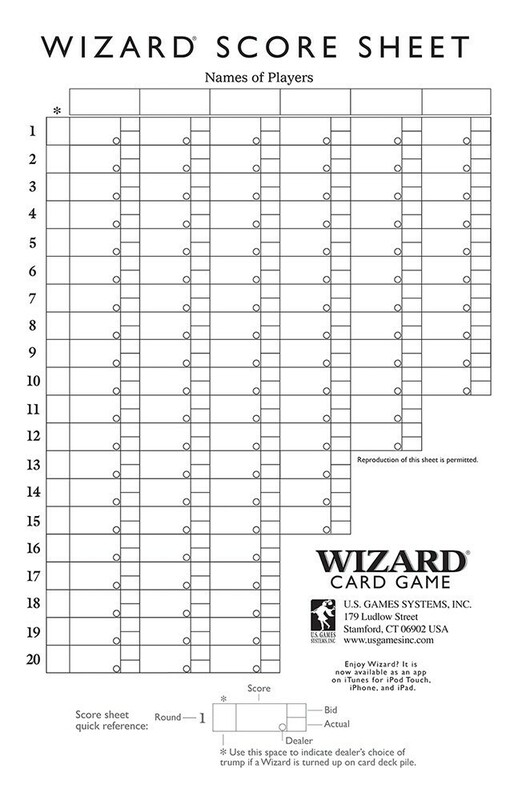 Oversized Scorepads can be used with all versions of Wizard® Card Games: Original Wizard® Card Game, Wizard® Card Game Let's Play Edition, Wizard® Card Game Large Index, Canadian Wizard® Card Game, Wizard® Junior Card Game, Wizard® Card Game Deluxe Edition, Wizard® Medieval Edition, and Fantasy Wizard® Card Game. See also: Wizard® Coins, Wizard® Bidding Wheels, Black Velvet Wizard® Hat, and Deluxe Felt Jester Hat.